I've received some interesting questions from visitors to my site regarding the Shower of Stars Shows. Click here if you have some of the answers. From Jimmy: My father told me that a Horace Bozeman Jr. from Shelby County changed his name to Max Sanders and went into the radio business starting with WVOK in Birmingham. I am working on our family tree and trying to verify what he said. Not sure when all that transpired or what happened to him. Family heard he ended up in the midwest owning a lot of stations. Never came back home. All his immediate family as far as brothers and parents are dead. Found your site and thought you might know. Might have to verify the name and station to make sure my dad had the right information. Jimmy: Thanks to Johnnie Hayes, here's the answer to your question. Hope it's not too late. WVOK was bought by John Bozeman, formerly of Woodstock, AL, who started in radio in Birmingham in 1938 (same year as Joe Rumore). As he advanced in the entertainment business, he changed his name to Mack Sanders. Mack was mildly successful as a recording artist, but more so as the owner or part-owner of several radio stations. For a time, he had a midwestern TV program as "Kansas Mack." He was friends with Roy Clark and owned some stations with Roy and with Jimmy Dean. Mack and Jimmy started the Jimmy Dean Sausage Company, but before it grew, Mack sold his share to Jimmy. Mack married Mel Tillis's singing partner, very talented singer/songwriter (and author) Sherry Bryce from Phil Campbell, Alabama, some years before they bought WVOK as well as stations in Knoxville, Nashville and other cities. WVOK and the Knoxville stations were sold before Mack and Sherry left Birmingham. 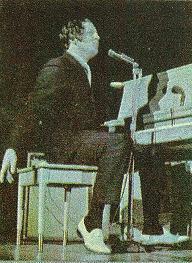 Mack later leased WYDE in Birmingham and operated it for just over a year while living in Hot Springs, Arkansas where he and Sherry owned a radio station. Sanders died suddenly in 2003 while visiting his daughter in Nashville. Sherry is doing well and seems to be enjoying the real estate business. She still receives royalties from her songs, and some of her own recordings are still being played in the U.S. as well as other countries. In fact, she is currently a rather hot item in some of those countries! From Andrew in Sheffield, England: I was fascinated to discover your website page showing publicity for the WVOK ‘Shower of Stars’ spectaculars back in the 60s. 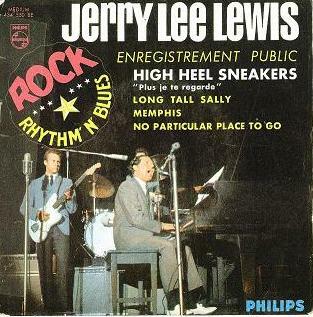 The subject is of particular interest to me as a Jerry Lee Lewis fan. As I’m sure you probably know, the album sleeve note suggests that the recording of "The Greatest Live Show On Earth" took place on 1st July, whereas your note indicates that the date of the show was July 18, 1964. July 18, 1964 is the correct date. Then we started discussing the photos on the original album cover vs photos contained in the Bear Family CD. None of them really matched up being from this show. Here's some of the photos from the "live" album cover. Apparently, some of the photos were taken at the WVOK Shower of Stars and some were taken at the WBAM Shower of Stars. From Shaun in Wales: I've just come across you're excellent website and was particularly taken by the line up for the 1963 show contained on the advertisements page. I write for the Rockabilly Hall of Fame and the Traditional Country Hall of Fame and was thinking of doing a short article on this bill. If you have any information on this particular show and memories you would like to share send them to me and I will pass them along to Shaun. NOTE: Shaun is referring to the March 2, 1963 show. My Boss wants the lyrics to a song Joe sang on the radio. Forgive me but I am not familiar with this song. Don't know the title but it is something about a monkey. 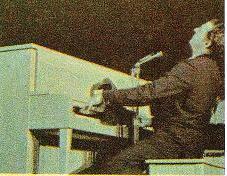 **DJ Johnny Poer indicated "Joe never sang anything on the air while I was there."